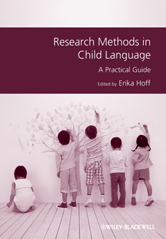 This is a comprehensive and accessible guide to the methods researchers use to study child language, written by experienced scholars in the study of language development. Presents a comprehensive survey of laboratory and naturalistic techniques used in the study of different domains of language, age ranges, and populations, and explains the questions addressed by each technique. Presents new research methods, such as the use of functional Near Infrared Spectroscopy (fNIRS) to study the activity of the brain. Expands on more traditional research methods such as collection, transcription, and coding of speech samples that have been transformed by new hardware and software.